Joseph Coveney, farmer, b. 29 Jan 1805 County Cork, Ireland, d. 11 Feb 1897 Buchanan, Berrien, Michigan, , m. 4 Sep 1837, South Bend, Saint Joseph Co., Indiana. Louisa Martindale Roe b. 22 Jul 1819 Henry Co., Indiana, d. 8 Jun 1894 Buchanan, Berrien, Michigan, m. 4 Sep 1837, South Bend, Saint Joseph Co., Indiana. In the 1910 census, Rettie and Carl are still living on Chicago Street. Charles is listed as a salesman of school supplies. There are no children listed. Charles gives both his parents' birthplaces as Virginia. Rettie gives hers as Ireland and the United States. Living next door is 45 year-old-widow Grace Cornell and her daughter Alice. It appears that sometime after 1920 the couple divorced. Charles married long-time neighbor Grace Cornell. In the 1930 census Charles and Grace appear on Chicago Street. Charles' occupation is given as a speculator in a brokerage. A Rettie M. Noon appears in the 1930 census of Clermont, Lake Co., Florida. 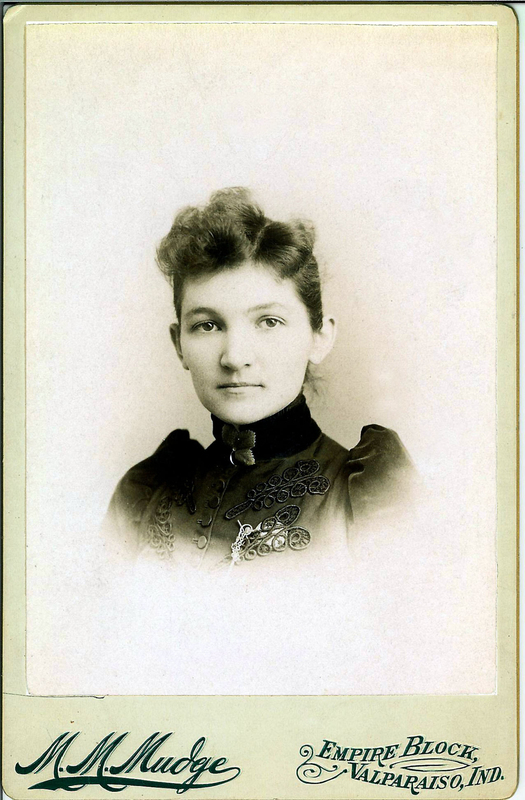 She and her husband William E. lived at 835 Broome Street and had been married for five years. Her age doesn't mesh with the birth record, but does match the age given on the back of the photo. (It wouldn't be unusual for a woman to shave five years off to be closer to her husband's age.) Other matches are her birthplace (Michigan) and her father's birthplace (Ireland), although her mother's birthplace is given as Kentucky instead of Indiana, she had been confused about it before. Rettie died in Lake County, Florida in 1949. Rettie's father was the subject of this article published by Anne Nicol Gaylor in Lead Us Not Into Penn Station. "He died as he had lived a disbeliever in the Bible God and the Christian religion." Next time you're "tooling along" through northern Indiana on your way to or from Chicago, plan to take a pleasant detour across the Michigan border to Buchanan and pay your respects to Joseph Coveney (Cove-ney), an irrepressible freethinker of the last century. Unlike so many freethinkers, whose ashes are scattered anonymously to the winds, Coveney's bones are traditionally interred. But there tradition ends, for he is buried near his Monument to Freethought, a monument whose uniqueness still attracts an occasional tourist to the Oak Ridge Cemetery in Buchanan, although it was erected more than a century ago. Its inscriptions may startle and perplex the religionists who happen on it, but they bring smiles of delight to those who share Coveney's views. the monument proclaims. And, "He died as he had lived a disbeliever in the Bible God and the Christian religion." Erected of granite and marble, the monument stands about 15 feet high and reportedly cost $3,000, at a time when $1,000 bought a five-room house and $12 a man's suit of clothes. Although it was rumored when it was erected that the monument had to be inscribed in England, since there was no one blasphemous enough to take on the task in the United States, actually it was done in nearby Niles, Michigan. And who was Joseph Coveney? He was born in the County of Cork, Ireland on January 29, 1805, the son of an English mother and an English-Irish father. He attended parish schools until he was 13 and then learned the weaver's trade. When he was 20 he came alone to the United States, arriving in New York on May 26, 1825. In New York he learned carpentry, a trade at which he worked for several years, first in New York, later in Schuylkill County, Pennsylvania and then in Indiana. In the autumn of 1837, when he was 32 years old, Coveney married Louisa Martindale Roe, the oldest daughter of a prominent pioneer of Portage Prairie, Indiana, near the Michigan border. Some accounts describe her father as a pastor, others as an illustrious citizen. The various accounts agree that Coveney met Ms. Roe when he built a house for her father. During the early years of his marriage Coveney continued his carpentry trade while farming 40 acres of land near Buchanan, Michigan, purchased through the government land office for $1.25 per acre. The Coveneys had 13 children (poor Louisa), and in 1854 Coveney built a "fine fourteen-room home." By this time he had acquired 600 acres of land and was one of the richest men in the area. He grew fruit and wheat and his orchards and wheat fields were locally famous for their large yields. Later he travelled to California where he "did not strike gold but did earn a great deal of money by use of carpentry skills." He made at least two trips abroad to his native Ireland and to England. He died at 92, well-thought of by his neighbors who, for the most part, spoke of his generosity and kindness and took his Monument to Freethought in stride. The Monument to Freethought was erected in September of 1874, more than 25 years before Coveney's death. Besides being a vehicle for expressing Coveney's philosophy, it served as a family monument with the dates of the births and deaths of two daughters who died in childhood inscribed on one side of it. The monument is surrounded by a dozen small headstones, including those of Coveney and his wife. Coveney's headstone carries his famous initials: J.C. The monument has numerous inscriptions on its four sides and these include FREE THOUGHT, FREE RELIGION, FREE SPEECH and FREE PRESS, with additional homilies engraved under each heading. An ardent admirer of Robert Ingersoll and Thomas Paine, Coveney included Paine's words: "The world is my country. To do good my religion. " Also an apt warning to posterity is recorded: "A word to the wise. God in the constitution is the end of liberty. Beware how you unite Church and State." Other inscriptions are quite diverse (and hard to read, due to weathering and vandalism): "The Christian religion begins with a dream and ends with a murder." "All Christian denominations preach damnation to the others." "Remember Mary Dyer hanging on the big elm on the Boston Commons a victim to Christian superstition." Mary Dyer was a Quaker publicly hanged on Boston Commons on June 1, 1660, for the double "crime" of preaching the Quaker creed on the Commons and of failing to leave Boston when ordered to do so. One inscription on the north side of the monument, the FREE RELIGION side, remains very clear: "Nature is the true god, Science the true religion." Coveney's Monument to Freethought has withstood a certain amount of assault and battery. While little contemporary criticism appeared in local papers, probably due to the prestige of Coveney and the relative popularity of freethought at that time, a Chicago paper, the Daily Times, denounced Coveney, and the Niles paper engaged in occasional editorial sniping. Vandalism followed. Reportedly, some "small ornamental devils perched on the four corners" were destroyed along with the spire on top. And the monument was bathed in tobacco juice. Wrote Coveney, according to an early history book of the area: "I was reared in a Catholic country but it remained for a Protestant Christian to try to refuse me the right to maintain this monument in a public cemetery. I had inscribed thereon some of my sentiments on the religious fallacies of the day. These inscriptions, not coinciding with the views of the orthodox element, a minister's son, urged on by Christian hate, marred and defaced the monument in a barbarous manner. His act received the commendation of some of the strictly orthodox, though it is but fair to say that all of the most prominent citizens of Buchanan condemned the act and used every effort to prevent its repetition. Testaments abound to the genial temperament, the character and generosity of Coveney. Wrote contemporary local historian Franklin Ellis in 1880, "He is esteemed as a shrewd businessman, a good practical farmer, an intelligent citizen and is respected by his neighbors." Another noted that he did seem to possess "a mischievous drift toward plaguing the pious. " The irrepressible Coveney kept a team of horses named Jesus and Christ, and at one time, the Niles Daily Star reported, "had three horses, two black and one white, which he named after the deity." Indiana Marriage Records Index, 1845-1920. Provo, UT: Ancestry.com, 2000. Original Data: Works Progress Administration. Index to Marriage Records Indiana: Indiana Works Progress Administration, 1938-1940. Joseph Covney household, 1880 U.S. census, Berrien County, Michigan, population schedule, town of Buchanan, enumeration district [ED] 5, supervisor's district [SD] 1, sheet 49A, dwelling 519, family 550; National Archives micropublication T9, roll 572. Charles Crumpacker household, 1900 U.S. census, Porter County, Indiana, population schedule, town of Valparaiso, enumeration district [ED] 81, supervisor's district [SD] 10, sheet 5B, dwelling 124, family 139; National Archives micropublication T623, roll 398. Charles Crumpacker household, 1910 U.S. census, Porter County, Indiana, population schedule, town of Valparaiso, enumeration district [ED] 138, supervisor's district [SD] 10, sheet 17B, dwelling 387, family 419; National Archives micropublication T625, roll 374. Charles Crumpacker household, 1930 U.S. census, Porter County, Indiana, population schedule, town of Valparaiso, enumeration district [ED] 4, supervisor's district [SD] 1, sheet 15A, dwelling 325, family 349; National Archives micropublication T?, roll 622. William E. Noon household, 1930 U.S. census, Lake County, Florida, population schedule, town of Clermont, enumeration district [ED] 23, supervisor's district [SD] 5, sheet 4B, dwelling 119, family 121; National Archives micropublication T?, roll 322. Family genealogy of Martindale as researched by Milton R. Rhynard. Data downloaded 26 Mar 2005. This photo has been placed with a family member. If you'd like a high resolution scan, just "right click" on the image and select "Save Image As" to save to your computer.